What’s not to love about pandas? They’re big, lazy, and oh, so cute! When I think pandas, I think of these creatures as big balls of fluff that don’t do much of anything, except for sleep and eat bamboo. Perhaps this is the exact image that Rotten Thread is trying to dispel with their “Panda” tee. This design has a tough-looking panda with a bandana around its neck. I’m not so sure that this animal would enjoy to being called “adorable” or “tubby,” and I definitely wouldn’t risk it! The men’s version is printed on green, while the women’s version is printed on pink. 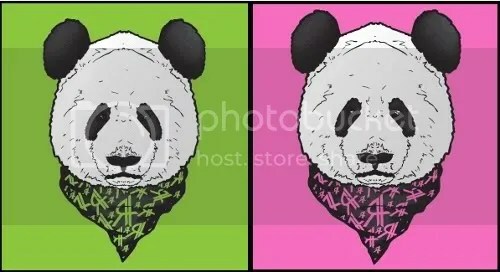 I don’t think that there’s a particular message behind these color choices, but I’d like to think that Rotten Thread is saying that the girl pandas can be just as tough as the boy pandas! If you love these tees as much as I do, then you’re in luck because Rotten Thread is giving away a panda tee to one lucky reader! All that you have to do is follow the instructions below and you’ll be in the drawing for the panda tee of your choice. This contest is open to U.S. residents only. The rules are simple. All that you have to do is leave a comment with names for the two pandas, one for the male and one for the female. The commenter with the best names for the pair of pandas will win his or her very own Panda tee from Rotten Thread. This time, the winner will not be selected by random. Instead, I’m going to let a friend decide which names are the most creative. So, put on your thinking cap and name some pandas! You can submit as many names as you want, as long as they are in pairs. Please also make sure that your e-mail is somehow linked to your comment(s). The contest will end on Sunday, November 22 at 11:59pm Eastern Time. I will announce the winners next Monday, so be sure to check back to see if you’ve won! Good luck! 28 Responses to "Rotten Thread Contest!!" Sweet submissions so far, keep em coming! !